The Bertec Vision Advantage (BVA) identifies dysfunction in the vestibular ocular reflex (VOR) per the Dynamic Visual Acuity Test. The BVA provides a more objective test than the standard clinical DVA test using an eye chart. The BVA also includes a Gaze Stability Test that identifies when the VOR falls below normal limits and whether there is an asymmetry between the left and right side. These advanced capabilities allow the clinician to customize treatment to the patient, resulting in optimal patient outcomes. Do your patients have the optimal eye and head coordination to maximize their performance? Find out using the Bertec Vision Advantage system, which identifies dysfunction in the vestibular ocular reflex (VOR) per the Dynamic Visual Acuity (DVA) Test and measures the head velocity, axis, and direction where visual accuracy breaks down per the Gaze Stabilization Test (GST). Eliminating the need for long, unruly cords, the wireless and lightweight head-worn sensor ensures that your patient’s head movement is un-hindered and free-moving. The sensor is designed to detect head movement in all directions, so our software can distinguish whether a patient’s head is moving correctly for each test. The Bertec Vision Advantage’s portable design allows your facility to use the system in multiple locations to improve patient workflow. Visual Processing Time (VPT) – this quick screen ensures the patient can process the optotype (letter “E”) stimuli quickly enough to use DVA and GST protocols accurately and reliably. Baseline Visual Acuity (BVAT) measures a patient’s visual acuity with the head stationary. The results are then used for comparison to visual acuity while the head is moving during DVA and GST protocols. Dynamic Visual Acuity (DVA) provides an assessment of the smallest character the patient can identify accurately while the head is moving at a specific and constant velocity. Data can be collected for any axis of rotation (yaw, pitch, or roll) and are analyzed and reported for each direction of rotation separately. Results indicating significant loss of visual acuity in one or both directions are considered an indication of VOR impairment. Gaze Stabilization Test (GST) measures the head velocity, axis, and direction where visual accuracy breaks down. Results provide insight into a patient’s effective use of VOR as it relates to functional demands for activities of daily living, and clinicians can use the data to make training decisions and document progress. Patient Training uses computerized VOR training to simulate gaze stabilization X1 exercises, with selectable controls for velocity and direction of head movement. Training exercises are customized to patient performance on DVA and GST and can be programmed to progress through varying levels of challenge depending on patient’s successful completion. Progress reports are automatically stored for printing. The Bertec Portable Functional is a longer yet portable and highly sensitive balance force plate designed as a walkway for mobility assessment and training. The longer force plate allows the clinician to assess and train the patient on tasks that mimic daily walking, stair-stepping, and sit-to-stand activities. Assess and train your patient on tasks that mimic daily walking, stair-stepping, sit-to-stand, and weight shifting activities on longer, yet portable dual-balance force plates designed as a walkway for mobility assessment and training. Benefits include: standardized assessment protocols with normative data, eleven assessments and five training menus, flexible training menus with hundreds of options, real-time parameter changes, and a menu of training exercises for functional training with visual biofeedback. Easily transported, the Bertec Portable Functional is powered by USB and configured with a touchscreen laptop and wireless remote. The highly sensitive, low profile design allows easy access for your patients suffering from dizziness, balance problems, and/or motion sensitivity. Portable system powered by USB providing assessments for patients with balance and/or mobility problems. Great for treatment using biofeedback! The Bertec Prime IVR adds Immersive Virtual Reality (IVR) to enhance clinical balance assessment and training. The immersive screen used in the Bertec Computerized Dynamic Posturography (CDP/IVR™) system is combined with a fixed dual-balance force plate. This unique product combines the flexibility of a small, force plate with the power of IVR training scenes. The Bertec Prime IVR includes a suite of assessments as well as training options to provide targeted and customized therapy depending on the needs of the patient. Provide therapy to patients at a higher level by utilizing immersive virtual reality to perform assessments and enhanced clinical balance training. This unique product combines the flexibility of a small force plate with the power of IVR training scenes. Provide your patients with an interactive and modular experience through an immersive virtual environment and visual surroundings. Create visual conflict with and without immersive virtual reality backgrounds depending on the needs of your patient. The Bertec Prime IVR includes a suite of assessments as well as training options to provide targeted and customized therapy for patients suffering from dizziness, balance problems, and/or motion sensitivity. Powered by USB providing assessments for patients with balance and/or mobility problems. The Bertec Vision Trainer (BVT) offers performance testing and training programs to quantify reaction times, eye-hand coordination, and visual memory. Bertec implements a series of hand-eye coordination-based training modes. These trainings provide a stimulus that the user must identify and respond to by physically touching the target in the quickest possible manner. BVT offers customizable settings that are tuned to push the human visual-motor system to perform at its peak. User-optimized specific parameters such as duration, size of target, location, and difficulty can all be tuned to place the optimal amount of demand on the subject. Additionally, cognitive-based training modes are designed to train important skills like pattern recognition, spatial awareness, and working memory. Integrating the Bertec balance platform offers insights into postural sway and eye-body coordination during training. The platform unlocks the balance training modes where users can perform eye-body trainings that use the center of pressure trace created by the balance platform to interact with the visual stimulus. Insights are garnered into the balance and stability of the patient in sensory stimulating environments. COBALT™ (COncussion BALance Test) is a balance test for athletes. COBALT can be used as part of a concussion screening and management program by providing an objective measure of balance control when relying on visual, somatosensory and vestibular demands. The patented COBALT protocol includes a unique set of testing conditions that places high demands on the visual and vestibular systems that traditional static balance testing does not provide. Research shows these more difficult conditions yield sensitivity in identifying individuals with suspected concussion. The COncussion BALance Test (COBALT) was specifically developed for the brief screening of athletes as part of a concussion management program. Utilize COBALT as part of a concussion screening and management program by providing an objective measure of balance control when relying on visual, somatosensory, and vestibular demands. COBALT benefits include: eight standardized test conditions (including head turn and visual motion sensitivity as well as conditions to increase vestibular challenge), pre-season baseline testing (using a four-condition screening version), and sensitivity to changes in performance. 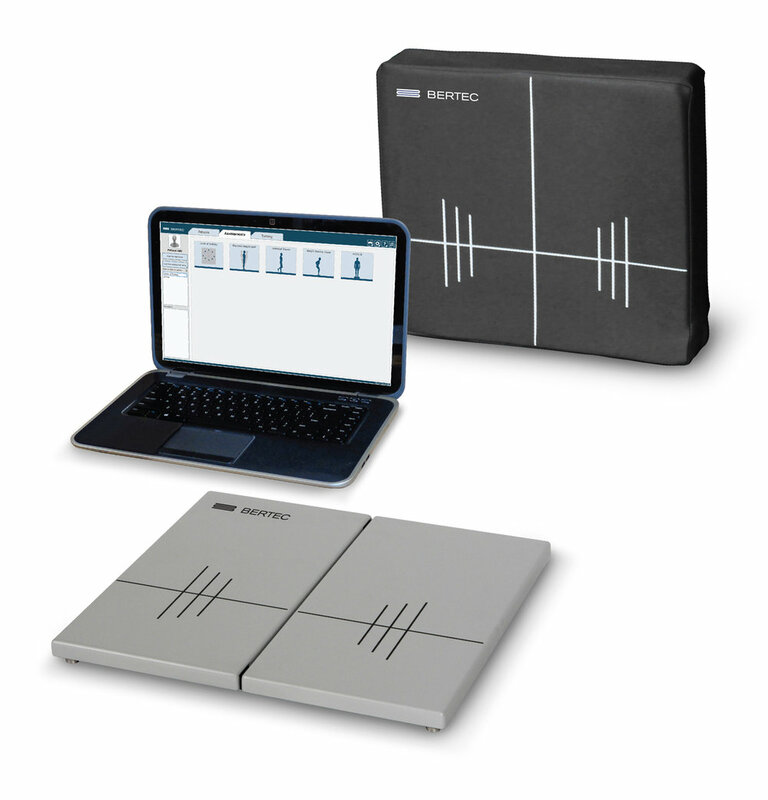 The Bertec dual-balance force plate is durable and portable allowing for highly accurate and reliable data collection under the most rigorous testing environments. COBALT can be added to the Bertec® Balance Advantage® Essential™ or Functional systems. The combination provides both a screening protocol and standard Balance Advantage® assessment and treatment capability to enhance your Bertec system. Bertec force plates lead the industry in center of pressure and force measurement accuracy with negligible crosstalk, drift, and signal interference. Analog signals sampled internally at 1000Hz are immediately processed by our custom electronics into digital data impervious to degradation. Take your lab to them. Bertec’s line of portable force plates allow for accurate and reliable data collection in more natural environments. Representing a legacy of excellence in biomechanics for over 30 years, Bertec is proud to offer the strongest industry warranty: 7 years on hardware and electronics for fixed (mounted) force plates. The Bertec Fully Instrumented Treadmill allows researchers to reduce gait laboratory space requirements and remove the limitations inherent in a traditional gait walkway. The unique design results in superior dynamic characteristics and a high natural frequency making it the best research-grade fully instrumented treadmill available on the market. Bertec treadmills offer high precision data at precision-controlled speeds and accelerations. The system’s high natural frequency, low vibration drive system, and Bertec’s custom electronics enable independent and highly accurate 6-component load measurements from each belt. Meticulously designed, the Bertec Fully Instrumented Treadmill is a split belt system with each side controlled independently (or synced) in both forward and reverse directions. With optional instrumented handrails and incline systems, you can expand your studies to collect more scenarios including upper and lower body forces in uphill or downhill setups. Works with all major motion capture systems. The treadmill’s user-friendly controls allow for testing numerous conditions with variable incline, speed, and acceleration options. Additionally, for deep custom integrations, our developer SDK is available for custom belt control and data access. Overhead structure and harness ensures patient safety and prevents falls and off track movements. Users can be comfortable and confident during testing. Measure ground reaction forces and assess mobility on customizable instrumented stairs. Because the stairs are on wheels and the force plates are easily detachable, the instrumented stairs have maximum portability. Use stand-alone force plates or add instrumented handrails to capture upper arm data as well. Instrumented Handrails offer you the complete picture with upper body force measurement. Our handrails are designed to handle high-impact movements so that your subjects can be comfortable and confident during testing while you get great data. Bertec’s biomechanics measurement technology captures movement details invisible to the human eye, helping you assess and track performance. Leveraging our best-in-class hardware, Bertec’s software partners provide robust jump analysis with automatic phase detection, auto zeroing, and endless jump outcome parameters. Some of the most innovative jump systems on the market recommend Bertec force plates for their most exacting customers. Learn more to find the right software solution that fits your needs. The preferred choice among top players and coaches around the world, Swing Catalyst analyzes swing motion from the ground up. In addition to the force plates, cameras are used with a full suite of drawing tools for video analysis. Swing Catalyst software provides features that make it easy to record lessons, compare swings, manage data, and post video lessons online to reach a wider audience. The astute coach will quickly become an expert in applied biomechanics. Objective force data assists the coach in analyzing the swing from a unique perspective, the ground reaction forces. We measure and analyze how the athlete uses their entire body to hit harder, farther, and more efficiently.